You can find inspiration anywhere and everywhere. It might be a book or a film, something you see in nature, a person on a train… or you can be inspired by the work of someone else. I’m not sure when I came across the beautiful illustrations of John Evelyn but I do know that as soon as I saw them I was wowed by the dreamy and ethereal nature of them. They are full of delicate clouds and landscapes, moons and clock towers and populated by tiny little figures looking up at the sky. You can see all of John’s illustrations here. One of John’s pictures in particular caught my attention, and he’s kindly allowed me to include it, and the sketch that preceded it, in this post. I love this drawing. I don’t know the story behind it (or at least I didn’t when I first saw it), and I just found it impossible not to create my own narrative for it. The landscape is so unusual – this tiny little hamlet with a crazy lighthouse, perched on top of an outcropping of land that just peeks above a sea of clouds. And then there’s the people at the bottom right, stood on their precarious little platform, pointing up at the view. I don’t think it’s possible to look at this and not wonder what’s going on. In terms of the scenario in ‘Home’, I always have a distinct idea that spawns the scene in my mind. Mostly I jump straight in to drawing the final piece without any preliminary doodling, whilst other times I have margin scribbles in my notebook which I return to – this was a case of the latter. In all instances I draw straight away with pen, no pencil work or anything so whatever happens, regardless of planning, there is a haphazard way these things come out (it also make the act of drawing a bit more like playing!) – which I imagine is how I’ve ended up making pictures with plenty of scribbly lines. I guess it takes poise and composure to be precise and sparing with your line-work, both qualities that I’ve yet to attain! 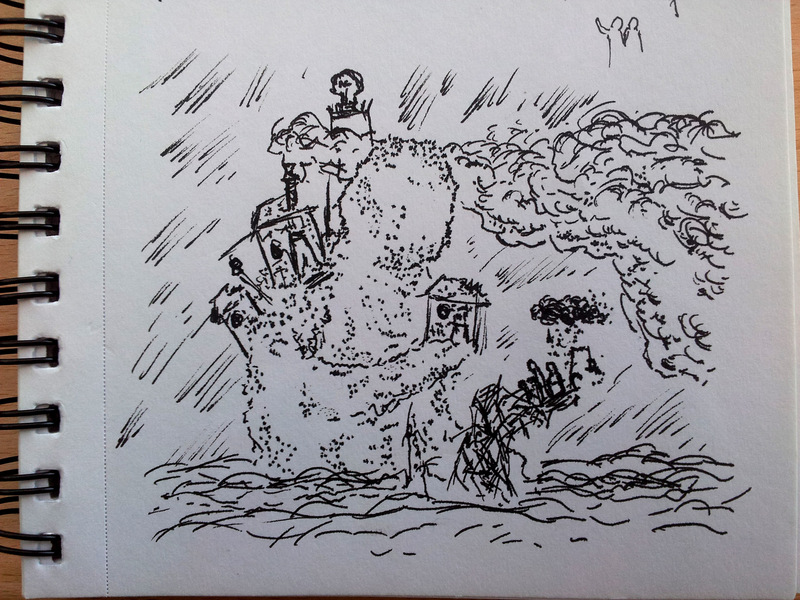 I did a very quick, very noisy doodle in my notebook with the intention of drawing it properly as soon as I got home. Ultimately I drew the final image over the course of 4 days in 30min – 1.5hr sittings. Once people have found each other, it is remarkable the lengths they will go to find a home. These homes, despite their worth, are fleeting so it is all the more important to put your all into finding yours while you can. John’s initial sketch for ‘Home’. There was something about this drawing that just wouldn’t leave me alone, this bizarre little dreamscape just kept tugging at my thoughts, until I had to ask for John’s permission to draw a version of my own. John was kind enough to agree. 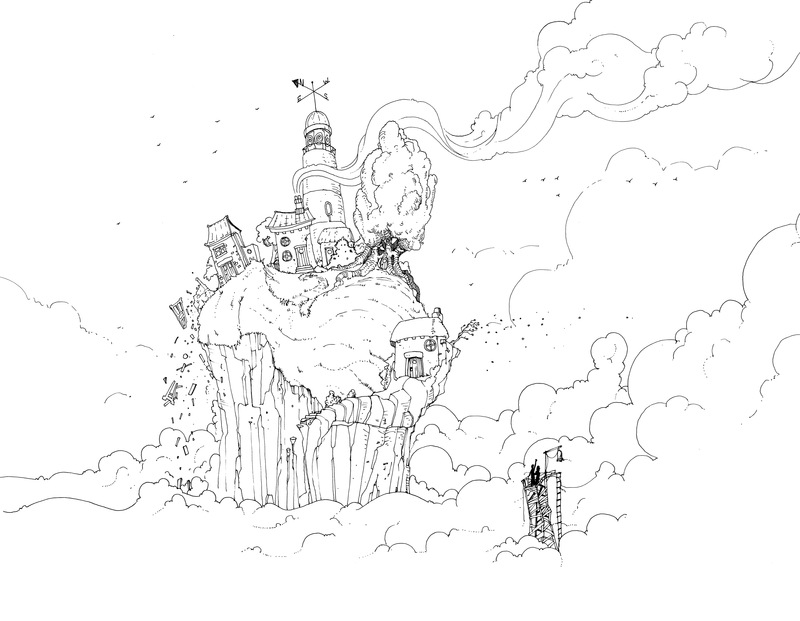 I knew that I wanted to concentrate a little more on the character of the village itself – drawing some cues from my earlier illustration ‘Doodle Street’ – and I also knew that I was really looking forward to drawing that lighthouse! My version of John’s fabulous ‘Home’ illustration. John and I both use pigment marker pens for our illustrations, but I find it pretty amazing that we both use them in such different ways. John’s lines, unhindered by any pencil sketching seem insubstantial, as if a strong gust of wind could blow the lines right off the page, and yet they conjure up an incredibly evocative dream-like world. I almost always draw something in pencil first, and in the case of this illustration I did a pretty detailed drawing before I picked up a pen. I’ve always enjoyed trying to create texture with as little line work as possible – some textures are much easier than others – and the rock and tree in particular are indicative of that. The way John and I draw clouds couldn’t be more different either, John’s almost look as if they have a life of their own and won’t be constrained by the direction of the wind. My clouds have always been, regardless of what illustration of mine they appear in, those big perfect white clouds you see against a bright blue sky. Dense and solid, looking like you could reach out and scoop a handful for yourself. 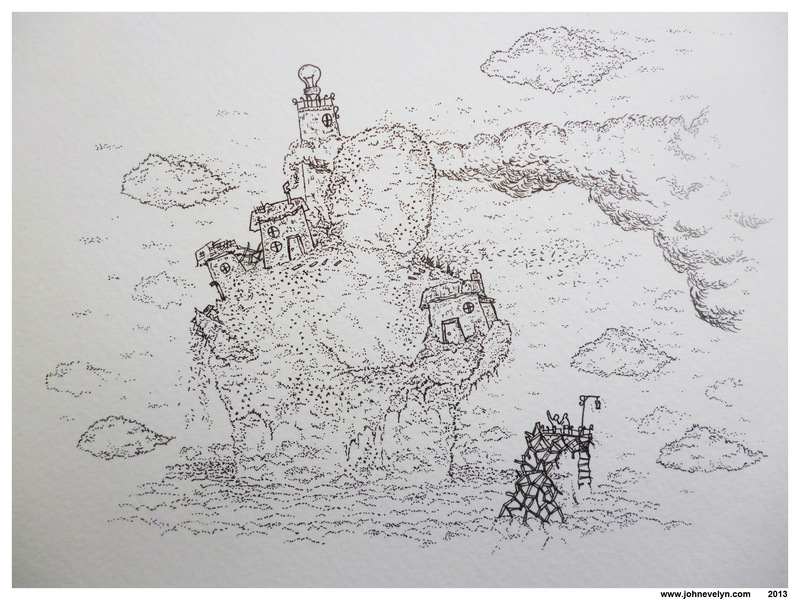 Looking at all the elements in each drawing, there are very few differences, I added a weather vane to the lighthouse and squeezed in an extra little house, but otherwise the content is the same. Stylistically I don’t think the two illustrations could be more different. John’s definitely benefits from his spontaneity and really evokes this faraway magical place far more than mine. Mine in turn possibly looks more believable, in a physical sense – but perhaps it suffers because of that. One thing that seeing John’s work, and diving into his imagination to create a version for myself, has done is to give me a huge urge to conjure up more imaginary landscape for myself. So there will definitely be more to come. I have to thank John again, not just for his words for this blog post but for being so generous in allowing me to steal his idea like this. You should definitely check out his work on Instagram and his Tumblr. John also makes some gorgeous music (he’s sickeningly talented).